Holey-ga-moley geysers!! 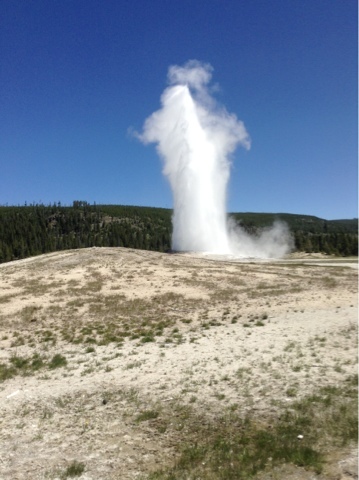 I knew about Old Faithful but Yellowstone has so many more. The landscape is beautiful beyond description. I was properly awed in all directions. The sights and wildlife and nature and mountains and rivers were beyond expectation. I took a lot of photos with my iPad this time so I could share some of the awesomeness with you. This is Old Faithful. We waited about 20-25 minutes for it to erupt. There was a huge crowd around it was obviously a popular attraction. 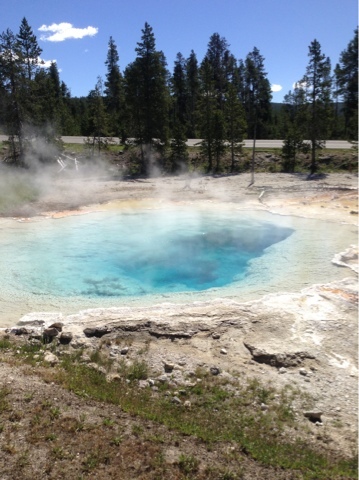 Upper Geyser Basin has more than 150 geysers in one square mile. We saw geysers everywhere. Some were pools, some were muddy, some just steam vents. We saw some amazing scenery and Yellowstone Lake was amazing. 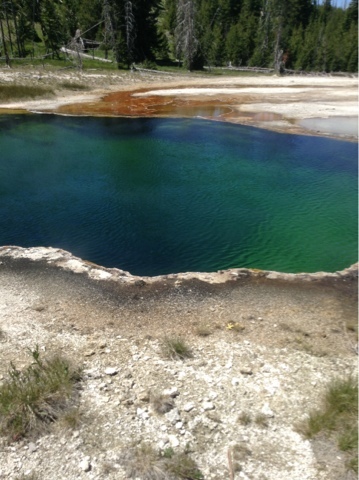 The West Thumb of the lake was full of geysers and pools as well. Even geyser cones in the water! 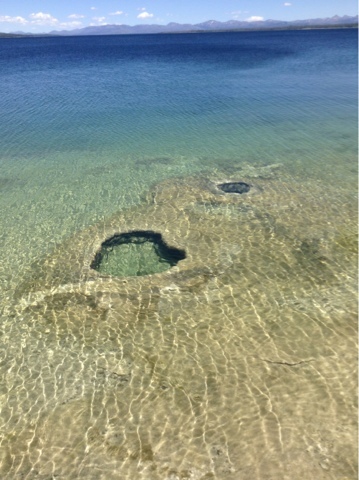 The water is so clear you can see the geysers under the water. This waterfall is called Tower Falls. It's something like 132 feet tall. 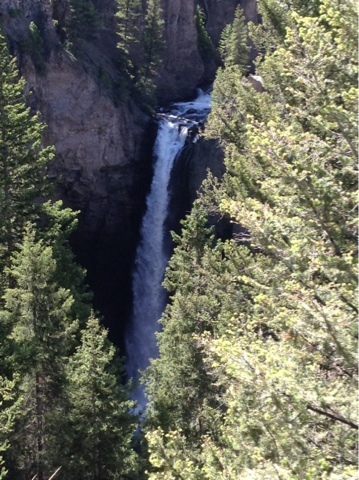 It feeds Tower Creek which then feeds into the Yellowstone River. We actually drove through the park in one day so we saw a lot fast. Except for the time we were stuck in a kong line of traffic because of road work. 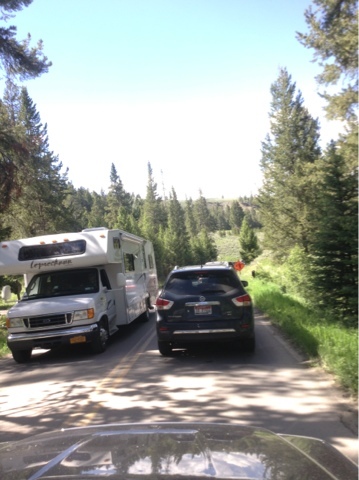 A flag an had vehicles stopped so only one lane could get through at a time. Strangely, every day on this trip we've encountered road work and flag men. It was always about the time I was hoping for a potty break. Some were very long waits. Signing off from the wild Wild West. Our next stop is Wyoming and visiting family. We turn in the rental after this and fly back to Florida. That is going to be another experience since there is no direct flight from Wyoming to Florida. Thanks for your comments, Lisa. Yes, we had a great time. We saw so much for the amount of time we were there. 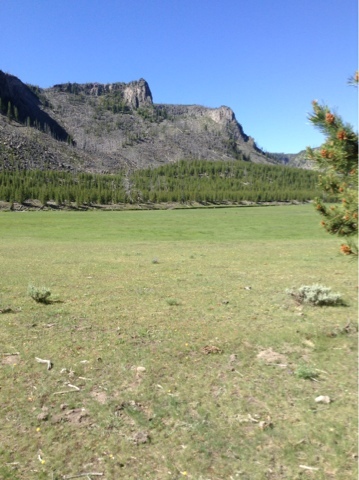 We even saw a variety of wildlife, including elk, bison, rabbits, badgers, and a number of birds of different species. Even an eagle!